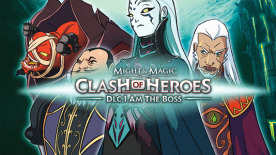 This product requires the base game Might and Magic Clash of Heroes. Embody the four powerful bosses - Azexez, Count Carlyle, Ludmilla, and Azh-Rafir - in Quick Battle, online or offline Multiplayer modes. Master their four new spells: Azexez's Demon Portal, Ludmilla's Spider Swarm, Count Carlyle's Bile Blast and Azh-Rafir's Palm Blast! This downloadable content includes the free DLC “Advanced Opponents” features.